Education is an adventure. The possibilities are limited only to the level of which you and your child seek to engage. Here at Grace, we invite you to not just try us but to experience the difference. Let us empower your child. It’s going to be exciting! 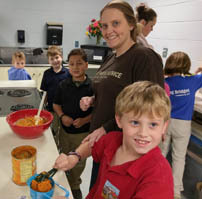 Grace Lutheran operates a Christian school for its members and others who are interested in an education emphasizing spiritual and academic qualities. We expect all children to submit to our total course of study and discipline. I would like to personally welcome you to Grace and encourage you to explore our opportunities for your child and family. In addition to our full menu of academic and extracurricular opportunities, we also offer the support of our ministry team headed up by Pastor Russ Gipson. We are a nationally accredited Lutheran Missouri Synod based school. I encourage you to schedule a personal tour so that you can see what we have to offer. If you are currently dissatisfied at a different school and are seeking an alternative, we are happy to enroll students at mid-year. We find that new students are immediately and unconditionally accepted. I believe this is because our students have a wonderful Christian classroom environment and naturally welcome new faces. Thank you for considering Grace as your child’s developmental foundation. Here at Grace, we believe in empowering young minds to be multi-dimensional through a model of leadership, discipleship, and innovation. We are committed to providing a diversified educational experience to challenge, stretch, broaden, and strengthen the mind. Our SMART 21st Century Classrooms and experienced instructional experts provide opportunities for advanced learning, hands-on interaction, social development, creativity, discipline, character development, and curiosity. We believe that all children are God-given and learn differently; therefore, we engage all of our children to discover their gifts and talents and challenge them to explore possibilities through our diversified curriculum. As a child grows and matures, moving up through our grade levels, we offer more diversity and complexity to the learning environment. In so doing, we nurture a multi-dimensional, well-rounded child with the academic foundation to be successful and creative in the world around him/her. Our students learn who they are as we help them become confident individuals grounded in God. We provide experiences to be an impactful citizen in their community through our service opportunities. Grace Lutheran School admits students of any race, color, national and ethnic origin to all the rights, privileges, programs, and activities generally accorded or made available to students at the school. While Grace Lutheran School provides a high quality general education for prekindergarten through 12th grade students, we are currently not equipped to teach students with learning disabilities. We limit our class enrollment to 18 students in prekindergarten and kindergarten, 20 students in grades 1–5, and 25 students in grades 6–8. We may deny admission due to space limitations and the ability of the school to meet the needs of a child.